So you're teaching a summer course. Ideally, you'd like it to be engaging. Memorable. Creative. Superfantasticaliciousexpialadocious. But of course there's the issue of you're tired. And so are the students. And maybe they're not that excited to be there. There are two different types of summer English programs. In one, students are opting in to take additional English courses because they love English (or their parents do) and they want to get ahead and appear even more impressive to future colleges. In another, students are taking a class to help them make up work, catch up with their grade level, or repeat a term that they failed. Get ready for a shocker, because I'm going to argue that the same strategies can be used with both classes. I taught an elective once that had an extremely mixed group of students. On the one hand, there were several kids at the top of their class, who were taking Creative Literature with me alongside their A.P. Literature class because they loved English so much. On the other hand, there were several students who were in the class because their English language skills were not highly developed and they didn't qualify for any of the school's honors or A.P. placements in their senior year. What did they all want and need? Engaging, interesting texts. Unique, creative project prompts. Chances to talk about what mattered to them. Of course, you will create the course that your students need. But I'm willing to bet some of the options below will work well regardless of what constituency you are serving this year. Where Donalyn Miller, Nancy Atwell, Pernille Rip, and so many others have led, it's definitely worth following! Students NEED to read because they love it. It broke my heart this week to hear from a teacher whose school turned the library into a computer lab. At first I didn't even understand what she was saying. "Oh," I asked, "you mean all the books are digital? Just ebooks and audiobooks?" "Nope. The library is now a computer lab." Ack. Building in a unit where you showcase great reads to students and then let them pick one they love to read and respond to will help them build those reading muscles we want them to have. If they aren't loving their first choice, help them navigate to a second choice. Or a third. If you can get every kid in your room reading a book they will love, you will have given them an incredible gift. Don't worry too much about having them prove that they read it. More important is to see them reading and check in with them to hear what they think about it. Finish up with a fun final response like a one-pager (pssst, you can sign up for my four free one-pager templates with complete instructions below). Blogging is an amazing way to get students excited about writing. It provides an authentic audience, an opportunity to dabble in media skills that are really relevant to virtually all ELA-based careers, and the chance to write about a passion. Add all that to the fact that multiple blogging platforms offer free sites, and there's really no reason NOT to include a blogging component in your summer school class. 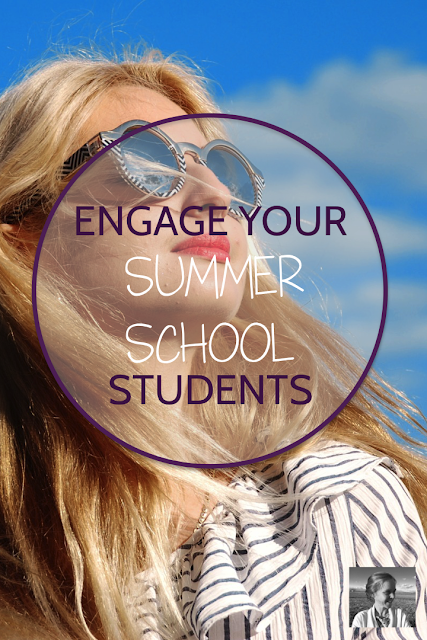 Make it a two week project, or give over one day a week to blogging through the whole summer term. Either way, your students are going to be very excited to dive into their blogs. If you're interested in this, jump over to my recent post, "A Beginner's Guide to Student Blogging." It will walk you through everything you need to know to get started. If you're not going to dive into blogging, journals are another great way to incorporate writing into your summer school class. Just ask students to bring in a blank notebook to leave in a corner of your classroom and you can tap the stack as a resource all summer long. With journals, students get to practice writing with no judgment, writing as fluidly and quickly as possible. No backspace button. No staring at a screen wondering what to write. Just the quiet sound of pens and pencils scratching and scribbling. 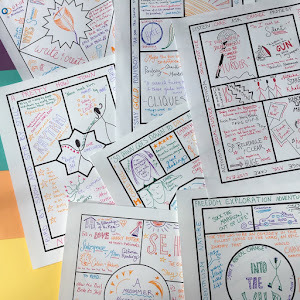 Journals are a great option for discussion warm-ups, early finishers, brainstorming sessions, creative prompts, vocabulary-based stories, and more. You'll find tons of inspiration for how to use them effectively in this post I wrote for teachwriting.org. Chances are, you have a lot of control over your summer school book choices. This is a great opportunity to choose books that will really engage your students. Unless you live in a really conservative area that will have issues with books that deal with real modern issues, consider choosing novels like The Outsiders, The Hate U Give, or I Am Not your Perfect Mexican Daughter. Wander through the YA section of the library in search of inspiration or head for the bookstore and see what's popular for teenagers. Choosing books that really speak to the issues your students are facing in powerful ways will help them follow through with the reading and get excited about discussing it. If you'd like to include a strong film in your summer course, I have a great resource to share. Recently in my Facebook group teachers from around the world weighed in on their favorite movie/book pairings. Check out this great thread over in my Facebook group, Creative High School English, to see the whole list. Whether because they are struggling with writing or because they love to write, your summer school students could probably use a lot of writing practice. But that doesn't mean it all has to be graded. Follow the new holy grail of English teacher survival and find ways to keep them writing that don't all involve copious feedback written by YOUR flair pens. If you use journals, ask students just to star two entries at some point for you to check on. If you do blogs, put students in partners or small groups to read and respond to each others' work via comments on the site throughout the summer. If you draft essays, do lots of peer editing with completion points from you and then have students select their very best work toward the end for you to grade. Collect in-class writing for a brief skim and sticker. Consider recording video or audio feedback when you do want to comment, rather than filling the margins of each page with tiny comments. If your summer course is on the smaller side, it could be a great opportunity to introduce the students to Harkness discussions. Since I went to a summer conference to study it in depth more than ten years ago, I have relied heavily on Harkness as my favorite discussion method. For me, there is no contest. Harkness teaches group dynamics and discussions skills better than anything else I've encountered. 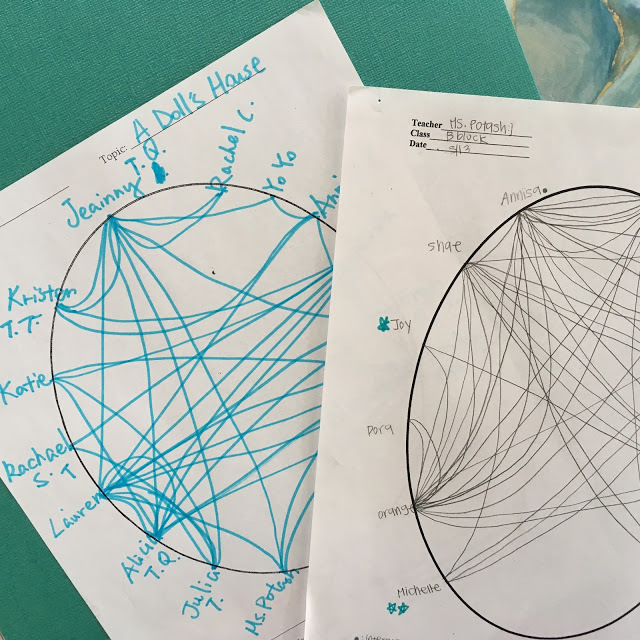 In a Harkness discussion, students sit in a circle (either around a big table, which I've never had, or by moving their desks into a circle, which is what I've always done) and discuss the topics of the day with the teacher acting only as a guide. While it sounds simple, there are certain important steps you need to take to set the students up for success. Talking carefully about group dynamics with them before beginning, choosing a student daily to be the discussion observer and report back to the group about what they are doing well and what they need to work on, and helping to troubleshoot with "Harkness warriors" (who naturally dominate discussions) are all important roles of the teacher. If you'd like to dive into this powerful method this summer, check out The Spark Creativity Teacher Podcast episode all about Harkness, which will introduce you to the method and how you can use it successfully. Well, if you're not a new reader, you know I'm a little obsessed with Angela Stockman's book, Make Writing. The concept of the writing maker space is a powerful one, but it isn't being used much yet. Be a pioneer and try it out in your summer course! Share maker materials with students and get them creating - puppets, paintings, lego creatures, photo essays, whatever - and then have them write about what they have created. I know from my own experiments that the maker process really does spark imagination and help eliminate writer's block. Read more here if you're ready to dive into the maker movement this summer. Whatever you're teaching this summer, I hope you've found some ideas to help you. And I hope you get a chance for a little personal recharging as well!